Live UTI Free is a patient advocacy organization, founded to address a gap in the sharing of unbiased, evidence-based information to sufferers of chronic UTI. UTI is the most common adult bacterial infection globally, affecting millions of people every year. Some sufferers have battled with recurrent UTI for decades. If inadequately treated, infection can become chronic. How? Infection is typically thought to be caused by free-floating pathogens. 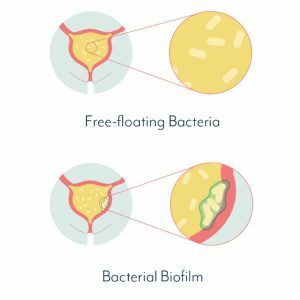 But we now know that in some cases pathogens can stick to the bladder lining and form an embedded structure, known as a biofilm. The biofilm shields itself from antibiotics and the body’s natural defenses, making it difficult to treat pathogens within it. There are currently two standard ways to conduct a test for UTI; either with a rapid dipstick strip test, or a urine culture. Both focus on free-floating pathogens, rather than looking for evidence of an embedded infection. These standard tests have been proven to be significantly inaccurate. This is frustrating for patients and practitioners alike. However, with better testing, the root cause of the infection can be found and targeted, for effective treatment. Where better testing methods have been used for recurrent and chronic UTI, such as Next Generation Sequencing, a specific pathogen or multiple pathogens have been identified in an overwhelming number of cases. For sufferers of recurrent UTI, finding and comparing advanced testing options can be bewildering. On its website, Live UTI Free presents the issues with standard testing in clear and understandable language, along with information about current advanced testing options. The goal is to equip patients with the knowledge to make an informed decision about their own care. Learn more about urinary tract infection and join the community at Live UTI Free.